The chosen path we tread on unravels turns we cannot foresee. It is the mystery of occurrences that lead us to surrender our control – albeit temporarily – over our emotions and intuitive gestures, thoughts, and reactions. And it is this truest form of an inner state that allows us to clearly perceive what we see. Peel off the labels, associations, merits and credentials and you are faced with the bare backbone of an artistic outcome in its raw and untarnished purity. 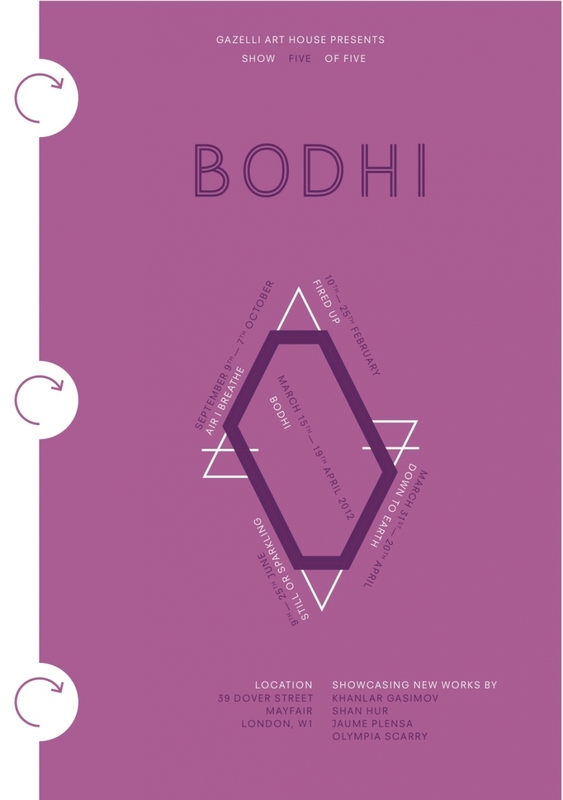 Marking the end of our inaugural series, and the opening show of our first permanent space in London, Bodhi provides an organic and open-ended conclusion to the various territories explored in the previous four shows: Fired Up, Down to Earth, Still or Sparkling and Air I Breathe. Touching on the topic of spiritual enlightenment through the means of contemporary art, the show brings to the forefront four diverse artists, through the eyes of which you are invited to make your own revelations. Each journey comes to an end, but every ending leads to a new beginning. Continuity being an innate feature of the gallery, we proudly open our doors and welcome you to the final show of the series upon which this gallery was founded. Thank you for your support and continued interest. I pledge to make it count.